Wow, I feel like I didn’t sleep at all last night. It’s one of those grey, tired days where I’m just slogging along. It’s a good day to relax with something easy, something that’s just for fun. So I grabbed a couple of graphic novels from NetGalley and thought I’d give you all my thoughts here. I love graphic novels. I’m a manga addict, and the American graphic novel can be equally enjoyable (frequently without the multiple volumes and cliffhanger endings that drive me nuts with the manga). From the award-winning educational software and kid favorite gaming website Jumpstart.com, arrives the first ever Graphic Novel from JumpStart and Knowledge Adventure! 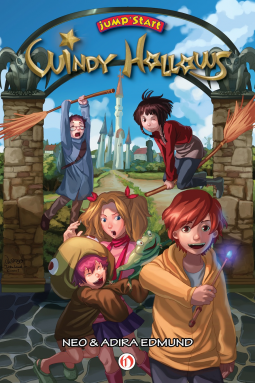 Come visit Windy Hollows and follow our group of adventurers: Logan, Maggie, Nicolas, Selena and Poe as they arrive at Oakcrest School of Magic. They discover their teacher absent but left a note, “Will be back soon. Read your lesson books and DO NOT TOUCH ANYTHING!” Follow them as they venture into Windy Hollows and embark on a series of quests to undo a potion that went terribly wrong. The illustrations in this one are pure eye-candy and will get the attention of the intended age group with no difficulty at all. The story moves along quickly and fully satisfies on many levels. Sadly where it failed was in not giving kids enough credit. The text was so minimal, with a lot of reliance on telling the story through pictures. I tend to believe that kids will make the effort to read when given the chance to do so, especially with such great images to drive the story along. A bit more narrative or dialogue would have cleared up some plot confusion, and honestly would have engaged the reader much more than this volume does as it is. So, my thoughts? It’s good, it’s fun, but could have been much better. On a scale of 1 – 5 I’d have to give it a nice solid 3 with a recommendation that it be used with those reluctant readers as an introduction into the world of adventure – and then follow up with something a bit more demanding. The second book really caught me. 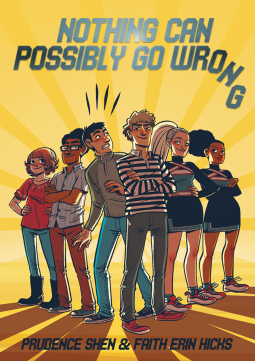 “Nothing Can Possibly Go Wrong” by Prudence Shen was excellent and Prudence just became one of my favorite authors. Right from the cover I knew I was going to have fun with this one. The story starts out with what looks like a typical school story – rivalries, trying to impress the right people, trying to keep your head down in regards to the wrong ones. Trying to get ahead and to help your friends get ahead in the easiest possible ways. And then we turned everything upside down, made allies out of the enemies, shoved the plot into a wild and crazy scheme that had no CHANCE of going right, or at least it looks that way, and oh yeah, wrecks Thanksgiving for multiple families. I loved it. I couldn’t put this one down. The illustrations caught the expressions perfectly, I laughed out loud more than once, and the ending was satisfying – and right. Not a stupid happily ever after but something a lot more real that works out for everyone involved. Oh yeah, I’ll be back on this one. Prudence, you’re writing more, aren’t you? So this one gets my highest recommendation for you graphic novel lovers, and hey, why not throw it at your teen that has a life way too busy to be reading books. I’ll bet they make time for this one. I’m a bit behind on posting reviews, so I hope all these authors and publishers can forgive me. 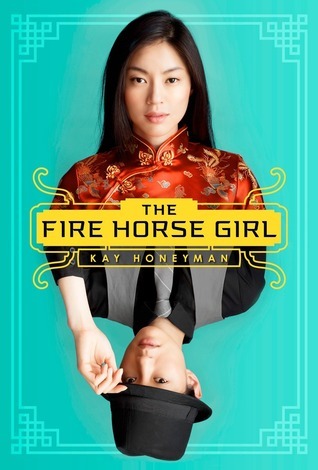 Let’s jump right into it with the Historical Young Adult tale “The Fire Horse Girl” by Kay Honeyman. Jade Moon is a Fire Horse — the worst sign in the Chinese zodiac for girls, said to make them stubborn, willful, and far too imaginative. But while her family despairs of marrying her off, she has a passionate heart and powerful dreams, and wants only to find a way to make them come true. Then a young man named Sterling Promise comes to their village to offer Jade Moon and her father a chance to go to America. While Sterling Promise’s smooth manners couldn’t be more different from her own impulsive nature, Jade Moon falls in love with him on the long voyage. But America in 1923 doesn’t want to admit many Chinese, and when they are detained at Angel Island, the “Ellis Island of the West,” she discovers a betrayal that destroys all her dreams. To get into America, much less survive there, Jade Moon will have to use all her stubbornness and will to break a new path . . . one as brave and dangerous as only a Fire Horse girl can imagine. The pacing on this story was interesting. We start with a trip from China on board a ship headed for America – where Jade Moon and her family hope to have a fresh start in California. The story feels like a historical novel here, elements of romance, pacing almost slow and dreamy. Even the portion about getting off the ship had this same feel. Don’t get me wrong, this story moved along well. I wanted to keep reading and did, my attention was grabbed from page one. Then we shift AGAIN and we twist the story into a piece on women’s rights in early 20th century America. What? Weirdly enough it all works…this story jumps in unexpected ways, but the reader is invited…and yes, even COMPELLED to hold on for the ride. It’s fun, it’s interesting…it’s disconcerting but well worth reading. I give this one a recommendation if you enjoy historical action adventure with that (of course) twist of romance. I’ll be sure to look for more books by this author. Ah, today has been a busy day for me. I’ve spent some time in working on a project in bits and dabs, trying to remember to rest and all too often forgetting. Oh, I paid for that little indiscretion but I’ll have fun announcing the outcome hopefully by next week. In those odd moments where I actually DO make an attempt to rest, I’ve been reading “Death Cloud” by andrew Lane, a young Sherlock Holmes story that takes place when the sleuth is only 14 and on his first case. Quite unwillingly I might add. Well at least it hasn’t so far anyway. Either way it’s a great book and I can’t wait to finish it and see how it comes out in the end. Also already making plans to get my hands on the next one in the series as I am most definitely hooked. This girl has been a rabid fan of Sherlock Holmes for a good 30 years now. I discovered him when I was about 12 and wandering the library looking for a good mystery to read. Oh, it was love at first sight, though I’ll admit that my crush ran more to Watson than Holmes only because he was not quite so DIFFICULT to get close to. And these movies have definitely kept me crushing on Watson though don’t tell anyone that. I’ve always wished I had that amazing attention to detail that Holmes had. Yet try as I might, my brain doesn’t seem to hold the right kind of trivia, and one of my aspie traits -faceblindness- keeps me from remembering anyone I’ve even spent a moderate amount of time with (who are you exactly?). Which is how I came to realize that a career in detection wasn’t really all that likely. Yet I still can tell you what my kids are up to three rooms away when they go silent interspersed by giggles. Perhaps deductive reasoning is something that can be rather tightly focused, more like a laser and less like a shotgun? Either way, my Sherlock obsession is getting put to good use this time around. I’m off to finish the book before bed. Heaven knows I’ll never sleep until I find out how Holmes gets out of THIS mess. Where’s Watson when you need him? Oh that’s right, we haven’t met him yet. Think he ought to be warned so we can avoid scenes like this one? Holmes you’re on your own! What is YOUR favorite Sherlock Holmes incarnation? Movie? Original story? Other novelization? Down South meets Japanese meets…STALKERS? 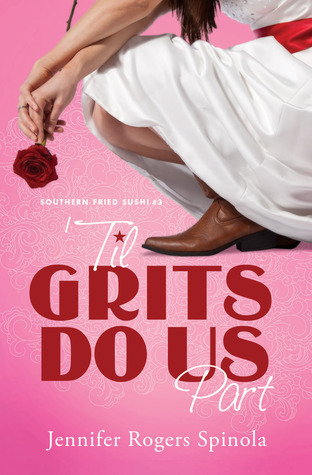 Last night I finished reading “Til Grits Do Us Part” – a book I picked up for the title just because I have a fondness for grits even if I was raised above the Mason-Dixon line. I had to really think about what I wanted to rate this one, and much as I wanted to give higher than three stars, I just can’t. I love the character of Shiloh. This is the third book and we’re following her as she’s stalked by someone who is sending her creepy messages and a whole lot of roses. Shiloh is still very much a fish out of water as she’s gone from Japan to the deep south. At times the supporting cast (all very quirky and very distinct) come off a little TOO stereotypical. I like the addition of Shakespeare to redneck, but seriously, all of it got a bit…much…at times. If the author hadn’t grown up in the south, I would have thought that she’d gone a little over the top out of ignorance. Instead she brings out the marvelous quality of being able to laugh at herself. Besides, let’s face it – stereotypes tend to form because there’s a lot of truth buried in them. The problem, much as I DO love the characters, comes in the pacing. More than once there seems to be a whole lot of things that happened between scenes that we find out in phone calls to Kyoko. And I’m not sure that everything quite clicked – she’s more irritated and annoyed by the stalking but there isn’t a whole lot of fear – and she seems more worried about her wedding than in what’s going on around her. Sadly all of this leads to choppy pacing and inconstant characterization that left me dissatisfied for the most part. The situations she finds herself in are at times crazy and terrifying. But the true gold of this book are in the discussions where she talks about her fear of death and her friends and fiance provide something to think about. When the crises comes I’m thrilled by how she handles it and comes to trust the Lord in new and exciting ways. OK, let’s bump this story up to 3.5 stars just for that. I wish I could give better than this, but it’s a good read all the same. If you’re in the mood for a little deep south romantic suspense, give this a try. In my second NetGalley review we’re returning to the future first explored in the the book “Swipe” by Evan Angler. Not a happy future though it looks that way at first glance. Beware the bar codes! In a future United States under the power of a charismatic leader, everyone gets the Mark at age thirteen. The Mark lets citizen shop, go to school, and even get medical care-but without it, you are on your own. Few refuse to get the Mark. Those who do . . . disappear. It’s a good thing that I read the first book or I’m not sure I would have understood what all was going on as we revisit Logan and his friends in Sneak, as we pick up almost right where we left off. Logan has thus far avoided the Mark – just barely. In this dystopic society where everything seems perfect for those Marked by the government, evil and corruption lies just underneath all this talk of unity and peace. Logan escaped it in book one and this book picks right up where we left off last time, as the race continues to not only stay out of the government’s hands, but also to find those who have been taken. Like the first book, there are times that this story reads too much like a rough outline of a really really good novel. I find myself craving more detail, wanting to see and feel and taste what’s going on. The addition of new characters keeps things interesting, but at the same time the characterization seems to suffer for it. I want to know Eddie and Peck and Joanne, and everyone else so much better. Double the length of the book and let us PLEASE just sink into this world and walk around into it! On the other hand the story is exciting and engaging. The Christian elements so loosely introduced int he first book are made clearer here in book two. Yet there’s no alter call, no beating over the head with the faith aspect, which I think the readers will much appreciate (I know I really did). I want more. Plain and simple, I want to know what happens next. Things have gone from bad to worse, to oh-my-goodness, you’re stopping the book HERE? (Much like the end of Empire Strikes Back in its own way). 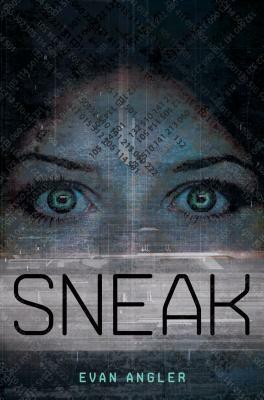 I finished my first book from NetGalley.com today and have to say I enjoyed the experience. I’m usually not a fan of reading electronically but this might be what pushes me over into the world of the Kindle. 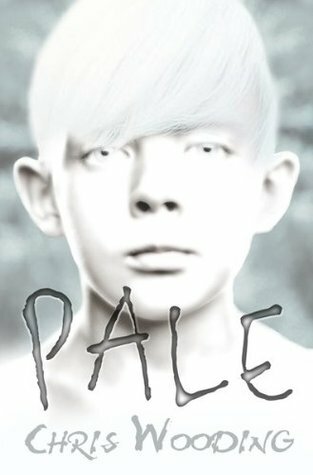 The first book I’m reviewing on Netgalley! The 13 chapter preview was certainly not enough – and leaves you hanging in the most awkward of places. Whew! Where to begin on this one. Having just gotten though a handful of Austen novels, I can see the influence upon this writer. Think of this as a cross between Pride and Prejudice, Upstairs Downstairs, and a bit of Downtown Abbey thrown in for good measure. Meaning if you love vintage pieces, with lots of characters from varying levels of society, you’ll enjoy this one. The story moves quickly, starting in the servant’s quarters and branching out until there isn’t a member of the household left untouched. You’ve got romance, a bit of intrigue, some definite factions forming, and alliances in all kinds of places. And secrets – don’t forget the secrets. My only complaint is in trying to keep everyone straight. I felt a little like I needed a scorecard, or at the least some kind of chart to show the intricate maze of connections and how everyone is related. 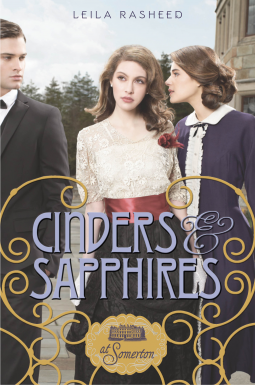 Though I think if I’d kept going, that might have cleared out a bit (much like in Game of Thrones – so readers of THOSE books who also like historical romance might also enjoy this book for that reason). I’m hooked, and have no problem with recommending this book. I’ll be looking for this one and whatever comes next in the series. It’s an interesting premise and I can’t wait to see how it all resolves. Onward to the next title! After the excitement of yesterday, I just wanted to spend the day quietly. No…let me be honest. After the excitement yesterday I really had no choice but to spend the day very quietly in bed. All of this wasn’t good for my heart and I was tired enough to actually behave myself for a change and rest. Because I’m not good at just resting, I also spent time reading. This has led to my getting into a great deal of mischief, mostly in the discover of Netgalley – a wonderful source of free books for professional readers. I’ll admit, I rather liked that phrase “professional reader.” How many of us as children who devoured the library during summer vacation rather than do something…I don’t know…healthy…like play outside…with friends….fantasized about somehow reading books for a living? In a sense working as a publisher certainly gives you that ability to a certain extent. But always there’s that pressure to do MORE with those manuscripts. Edit them into something better. Market them. Something. A professional reader is one who reads and then reviews the books. They work in libraries or bookstores where they can influence the buying decisions. Or they might review in various publications. Since one thing I DO have plenty of is time, I have started reviewing books for Netgalley. As of…today? So I added to my information bar over there on the right, what I’m reading for review right now. It’s fun. I get to read books before they come out for the reset of the world to enjoy. I’ll be posting the reviews here and on Goodreads for the time being though I might branch out a bit beyond that as well. And yay…free books! Which always is the ultimate pick-me-up after a day spent in crises and emotional overload. So out of curiosity, do any of you consider yourselves ‘professional readers’?